This thing sounds fantastic. Got it for free when I bought my new Apollo 8 but would have gladly paid for it. I used it on Rhodes, Hammond organs etc, and works very well. Nice chorus! I use this on ambient sounds, and vocals to create a different color. I really enjoy it! Great as a Doubler On Vox! Not used it on guitars yet so I can't comment on how it stands up compared to other guitar chorus plugins/pedals, but I did try it as a doubler aux effect the other day on a vocal track with great results. Got the idea from an article featuring Post Malone's engineer who uses it on his voice. I think it's another useful tool to have in your box but obviously if your on a budget you can get by without it. I didn't purchase it as U..A. kindly gifted it me for free when I registered my interface - Bonus! Although this is an awesome plugin which sounds very similar to the real thing, it is hard to get a good sound and isn't what I'd say describe as a lush sounding chorus. 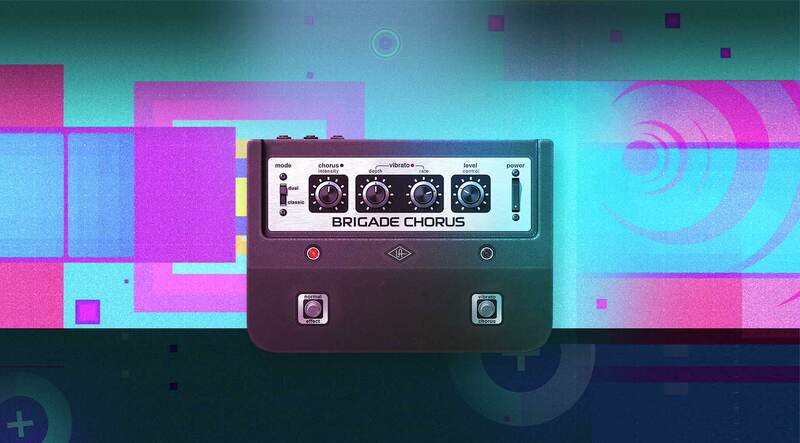 However, if you're looking for something that sounds like the old bucket brigade chorus pedals this is as close as you'll get!! now all my guitars sound like The Cure. You know how Chorus are sometimes diffcult to get right in the box, but I think this one is ok, sounds legit and does a good job on guitars. great chorus plug-in! Easy to use, my ears are impressed! A simple but fantastic plugin that you can't miss in your collection! This is a great recreation of an iconic chorus pedal. It’s not right on everything, but if you want authentic, retro character, this thing is awesome. Un bel chorus, sporca il giusto con un bel carattere vintage.